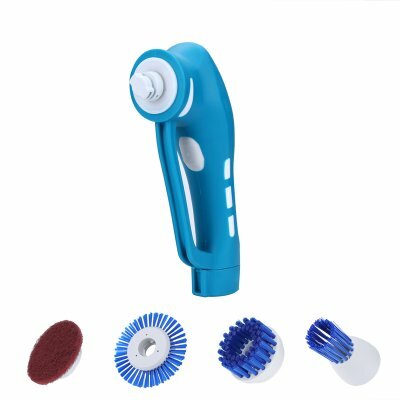 Successfully Added Electric Cleaning Brush - 4 Different Cleaning Heads, Multifunctional, Hand Held, Waterproof Design, Large Battery, Easy Usage to your Shopping Cart. With this multifunctional electric scrubber, you’ll be able to tidy your house and make it shine like never before. Coming with four different brush heads, this home cleaning aid has been designed to assist you in a wide variety of cleaning jobs. Whether you’re looking for a way to clean the bath tub, polish your sink, or whiten your plastic door and window frames – this electric scrubber tool has an answer to all your cleaning demands. Its extremely tough design is waterproof, allowing you to use it in the bathroom, kitchen, or outside without needing to fear about damaging your device. Additionally, it features an anti-slip and comfortable design – making it easy to hold and use no matter the size of your hand. Suitable for both indoor and outdoor cleaning, this powerful cleaning tool will make sure that your household always looks spick and span. The four included brush heads feature a soft long brush that is perfect for dusting off and cleaning door and window frames, a hard flat brush that can be used to remove the dirt from your tile floor or sink, a scouring pad to scrub and polish your kitchen and bathroom furniture, and finally a crevice cleaning brush that helps you to reach and clean all the narrow and tight corners in your home. No matter your cleaning demands, this multifunctional tool is guaranteed to put a smile on your face by turning the toughest and most time-consuming cleaning tasks into a fun and easy job. The cleaning aid packs a powerful rechargeable battery that offers up to 2 hours of usage time on a full charge. The different head brushes can be easily replaced – allowing simple and quick usage. Thanks to its constant and uniform speed, this electric scrubber makes sure that every piece of your home gets cleaned in the same thorough way – guaranteeing that not a single spot gets missed along the way. Thanks to its easy and efficient usage and truly multi-purpose design - this electronic cleaner is the perfect gadget to have at hand for people that wish to scrub, polish, and whiten their furniture in absolutely no time. This multifunctional electric scrubber comes with a 12 months warranty, brought to you by the leader in electronic devices as well as wholesale electronic gadgets..
Arabic: - أداة تنظيف كهربائي متعدد الوظائف - Chinese Simplified: - 多功能电动清洗工具 - Czech: - Multifunkční elektrické čisticí nástroj - Danish: - Multifunktionelle elektriske rengøring værktøj - Dutch: - Multifunctionele elektrische schoonmaak Tool - French: - Outil de nettoyage électrique multifonction - German: - Multifunktionale elektrische Reinigungswerkzeug - Hebrew: - כלי ניקוי חשמלי רב תכליתיים - Hindi: - Multifunctional बिजली सफाई उपकरण - Italian: - Strumento di pulizia elettrica multifunzionale - Japanese: - 多機能電動清掃工具 - Korean: - 다기능 전기 청소 도구 - Malay: - Pelbagai fungsi alat pembersihan elektrik - Norwegian Bokmål: - Multifunksjonell elektrisk rengjøring verktøy - Romanian: - Instrument de curăţare electrice multifunctionale - Russian: - Многофункциональный электрический инструмент очистки - Spanish: - Herramienta multifuncional de limpieza eléctrica - Thai: - เครื่องมือทำความสะอาดไฟฟ้ามัลติฟังก์ชั่ - Turkish: - Çok fonksiyonlu elektrikli temizlik aracı - Vietnamese: - Công cụ làm sạch điện đa chức năng.